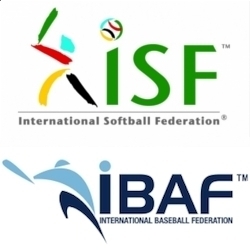 Following the historic votes of the International Baseball Federation (IBAF) and International Softball Federation (ISF), approving the formation of a unified international federation, IBAF and ISF leaders announced the name of the new international federation that will govern both baseball and softball together: the World Baseball Softball Confederation. “In addition to the increased visibility, our sports under one banner will provide the footing for clear and consistent messaging,” said Don Porter, WBSC co-President and current ISF President. “Our swift agreement on this issue is a good indicator of our ability to work together as a team and of keeping the focus on our primary objectives of further developing baseball and softball and of obtaining results that will help us earn a place on the Olympic Programme,” said WBSC co-President Riccardo Fraccari and current IBAF President. The WBSC leaders are in the Olympic capital city of Lausanne, Switzerland for a men’s baseball and women’s softball presentation before the IOC Olympic Programme Commission, in what will be the baseball and softball leaders first official order of business together, as they vie for inclusion on the 2020 Olympic Programme.